The content management system (solution "5. e-Commerce and website") enables you to fully manage your website's mobile version. These version, which can be simultaneously activated for all languages which your webiste has a standard version in, will be automatically made available to users who access the site's pages with a mobile device - and to them only. There are several advantages with being able to create specific versions for this particular type of device. With the CMS you can edit content specifically for the mobile version as well as intervene on the modules contained in the pages (e.g. the mobile version of a page will not contain all the Banner modules that are included in the standard version). This clickable image shows the CMS managing the mobile version of www.puntosicuro.it: three windows for three different functions are shown. On the left, in the background, you can see "Mobile navigation" which enables to control, within your own content management system, how different mobile devices will display the website's contents. On the top right, the "insert or remove" window is shown, which enables to add or remove modules from the pages: please note how you can quickly switch from the standard Italian language view to the Italian mobile version (you can also associate modules differently for mobile and standard pages). Finally, on the bottom right, you can see the window for editing a page with the "Mobile" tab which enables you to set a specific template for the mobile version, which can be different from the one used to display your website on standard computer screens. The mobile version of a website is automatically shown to users when they access it on a smartphone or tablet (regardless of make and model). This version is also recognized by search engines which, when a user searches for information (e.g. by googling key words) using a mobile device, automatically favour webistes with mobile versions over those that do not have one. Moreover, being able to offer a webiste which is optimally browsable both on a PC screen and on a smartphone naturally allows you to reach a larger number of users and offer your customers a much more complete service. 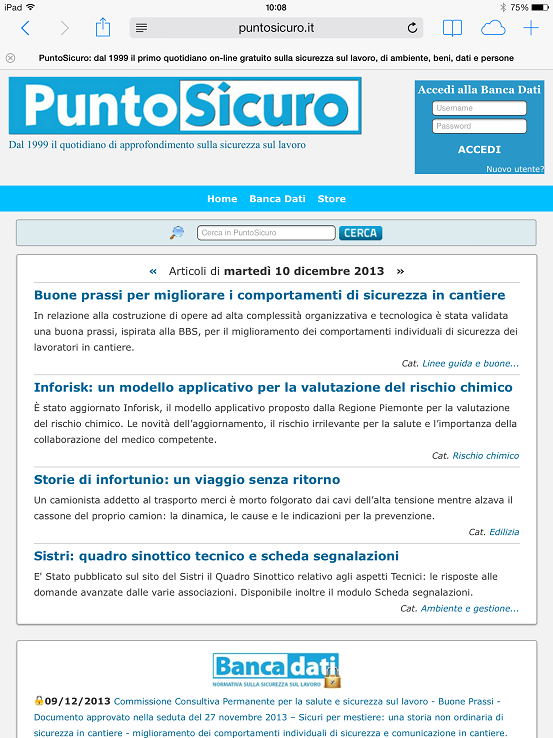 The clickable image shows the Punto Sicuro website in mobile version as it appears on a smartphone.